Epic's CEO thinks the Unreal Engine could represent platform-free gaming. During a keynote speech at GDC Taipei, Epic Games CEO Tim Sweeney had a lot to say about gaming, technology, and what we might expect to see in the future. 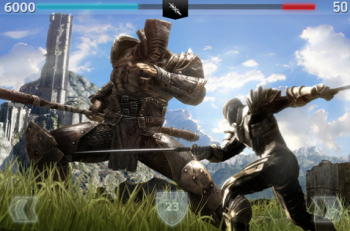 During the conversation, an interesting detail emerged that was later confirmed by Epic executive Mark Rein via Twitter: of all of the games Epic developed over the past two decades, Infinity Blade stands out as the most profitable in terms of man years invested versus revenue. "It's more profitable than Gears of War," Sweeney explained to the audience, emphasizing the implications for console developers. "Nowadays the high end of the game business is in these console games ... Activision invests almost $100 million per year in Call of Duty." Rein is quick to point out that Infinity Blade has not brought Epic the highest overall revenues, just the highest profits for the amount of time Epic spent making it. Regardless, Sweeney sees this as evidence that developers need to change with the times. If the common smartphone can catch up visually to the Xbox 360, which Moore's Law states that it will, games must naturally adapt themselves to be cross-platform experiences. It is for this reason that Epic's new engine strategy is called "Unreal Everywhere". Sweeney wants to see the new Unreal Engine not just on PCs and consoles, but also on smartphones, web browsers, and even Adobe Flash. "We expect to be able to build games that can scale from a smartphone to a high end PC," Sweeney said. "We expect an unprecedented amount of content portability for the future." Sweeney predicts that two other big factors driving console development will be digital distribution and free-to-play games. The ability to develop a free game using the Unreal Engine that will launch simultaneously on PCs and consoles is "a very real possibility".